Changing trends in backbone transport networks towards dynamic path provi sioning and evolving optical technologies have motivated the study of dynamic routing algorithms in the context of Multi Protocol Label Switching (MPLS) based networks. 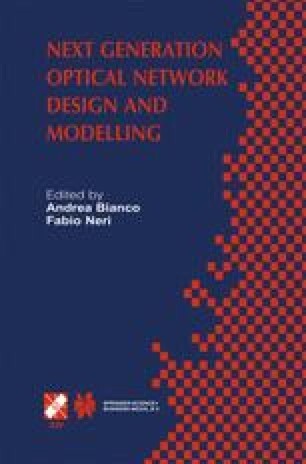 Several methods have been proposed for joint optimization of working and spare capacity in survivable optical networks. These techniques are centralized and do not scale well as they rely on per-flow information. This motivates the need for developing a) distributed algorithms with complete infor­mation, b) source based algorithms with partial information which can be easily obtained from traffic engineering extensions to routing protocols. In this paper, we develop dynamic algorithms for source based routing with partial information. The algorithms are classified based on the path selection ap­proach used for the primary path. We compare the performance of various routing algorithms through simulation studies, based on metrics such as the call blocking probability, average path length of an accepted connections, capacity redundancy, and effective network utilization. Our studies show that dynamic routing algo­rithms perform better than static routing algorithms using pre-computed paths even when the path selection in static algorithms is based on optimizing a global network metric. The other interesting observation we make is that the perfor­mance improvement of dynamic routing algorithms using K pre-computed paths is significant even for small values of K.
The research reported in this paper is funded in part by the National Science Foundation under grant ANI-9973102 and Defense Advanced Research Projects Agency and National Security Agency under grant N66001-00-1-8949.